Iggy's Castle is the first castle you'll encounter on your travels through Dinosaur Land. You won't be able to take Yoshi inside and will have to go through the castle on your own. At the end, you'll have to endure a boss fight to beat this level and be able to continue onward. The first area is comprised of a large fence that can be climbed. The controls take some getting used to: press to hold onto the fence, then use the Control Pad to climb around. Several Koopas will be climbing the net as well, some on your side, some on the other side, with the red ones being significantly faster than the green ones. The ones on your side can be stomped as if they were on the ground. To get rid of Koopas on the other side, press to punch the fence, which takes them out. This is also a great area to accumulate a few 1-Ups. Stomping while on the net accumulates the counter as if you were stomping several enemies in a row. As long as you don't fall down or punch, you will get more and more points until you start getting 1-Ups. Of the group of five ? blocks, the middle one contains a flower. If you need the flower you will have to push the P-Switch to drop the flower down. Don't let the Podoboo hit you on the way across the lava pit. Wait until it has fallen back into the lava, then climb across. The holes allow you to get on the other side of the fence yourself by punching them. While you could use it to avoid Koopas coming your way, they're not that hard to avoid. Press when you reach the door at the end to continue onward to the next area. This autoscrolling map features giant logs trying to crush you, which you must avoid. Stay left of the first one, then go to the right and "drag" the screen with you and you will be relatively safe from the logs. However, you still need to watch out for the two pits on your way. On your way, a flying ? block will pass you which contains a flower. Take it if you have the time but don't risk your life for it. Iggy sits on a platform that bobs back and forth on the lava. 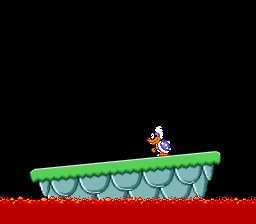 You must defeat Iggy by pushing him so he falls off the platform into the lava. To do this, you must jump on his head. He will move in whatever direction the platform is slanted to. If you're Fire Mario, his fireballs have the same effect and are easier to utilize. Iggy will very occasionally try to launch a fireball if he's left alone for too long. If you keep stomping on him, however, he will never retailate. Once Iggy is defeated, you will be able to watch a scene where Mario destroys Iggy's Castle. You will then automatically march on to the Donut Plains. This page was last edited on 20 December 2017, at 17:40. This page has been accessed 33,938 times.